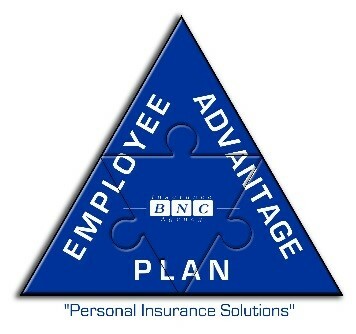 BNC Insurance Agency has developed the“Employee Advantage Plan” – a no-cost plan to the employer, which offers personal insurance products (Auto, Home, Renters, etc.) to employees at an exclusive discounted rate*. Participation is strictly voluntary and there is no minimum participation required to offer this service. Furthermore, enrollment is open year-round. While insurance has become a commodity to many these days, we at BNC believe in taking the time to get to know our clients. Everyone has unique coverage needs and the only way to uncover these needs is to consult with our clients. We apply this same approach to our Employee Advantage Plan. In fact, as Independent Agents, we are insurance advocates who work for our clients, not for an insurance company. Why BNC’s Employee Advantage Plan? BNC’s Employee Advantage Plan provides a win-win solution for both you and your employees! To learn more about ourEmployee Advantage Plan, please contact us today. * Rates subject to Underwriting approval. Other pricing options may be offered.